What is the structure and feature of HPY multi-cylinder hydraulic cone crusher? Today, we will talk about it. The fixed main shaft design makes HYP cone crusher has good mechanical performance, easy for maintenance and more reliable and safety. 1. 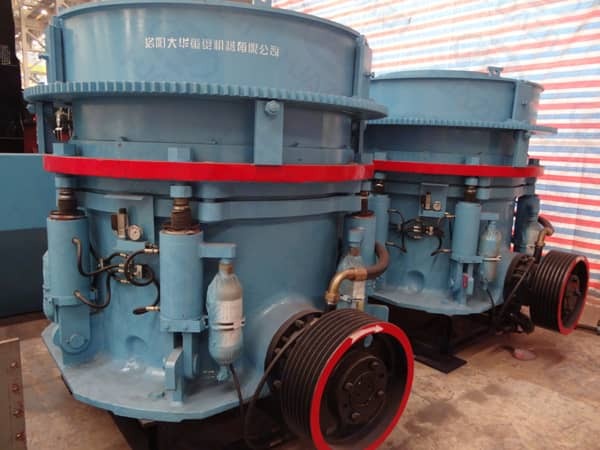 The main shaft of HPY cone crusher adopts lower overheat that fixed in the crusher foundation, and the movable cone is placed on the main shaft through socket bush. Eccentric assembly rotates around the main shaft driving the movable cone to crush the rock. 2. The main shaft of HPY cone crusher is thick and short, which bears larger crushing force. 3. The big inclined angle of movable cone and light slope may influence the material through put, but HPY series cone crusher applied big eccentricity design to offset the above structure defect. 4. The HPY cone crusher has big feed opening for smooth and easy crushing and the main shaft with no upper supporting point is favorable for protecting the crusher. 5. The added hydraulic cylinders and locking cylinders on HPY cone crusher can protect the crusher itself instead of complicating. In addition, it equipped with a hydraulic motor to automatically adjust the feed opening and assemble and disassemble the fixed & moving cone. 1. The big eccentricity can improve crushing capacity. 2. The rapid speed and big power can enhance crushing granularity. 3. Rising movable cone center and optimizing crushing cavity. 4. Thickened lining plate for longer life. 6. High output and high ore content. 7. The key parts apply high strength material to increase the weight of crusher for higher reliability. Previous Article：Why High Efficiency Complex Crusher is called High Efficiency? Next Article: How to Operate the Jaw Crusher?